PICK YOUR POISON! Perfect for your Halloween event! Shot glasses will skull head and crossbones imprinted on them. Perfect for serving a shot of your favorite blood! Zombie Pirate Vampire Witch drink glass - Holds 2 ounces of your favorite liquor! Each entrancingly two-side printed plastic acrylic shotglass is a spooktacular addition to a scary or renaissance theme costume party, setting an eerily death-defying mood. With its ghoulish Skeleton Skull and Crossbones dungeon-inspired design, it is the ultimate display for the most refined Halloween table. TRANSPARENT SMOKEY BLACK with WHITE printed ‘’PICK YOUR POISON’’ and Skull and Crossbones on the FRONT, Larger Skull and Crossbones on the back. All SIX (6) Glasses in this set have identical printing. No need to worry when your clumsy guests can't hold their liquor. Throwing a costume party and want everything to be perfect down to the cups your guests drink out of? If so, this Skeleton Skull and Crossbones shot glass set is just for you! Sure to be a hit with your guests and will go perfectly with your scary zombie, pirate, witch, vampire, medieval, alchemy, castle or other themed event. 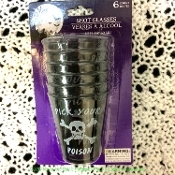 Includes Six (6) plastic shot glasses. Shot glasses are made of a crystal Smokey Black molded plastic, meant to be disposable, but are sturdy enough to be reusable if hand-washed to use again and again!